Lover of People and Life's Grand Adventures. "What the heck is an accidental artist?" stick with it, it's a good one! On my journey to becoming an accidental artist, I started out as a "multi-passionate" crafter dabbling in all kinds of creative endeavors: jewelry making, paper crafting, book binding, paper making, paper marbling, rubber stamping, scrap-booking, card making, soap making, glass fusing... you name it, I probably tried it! I guess you could say I was a serial crafter who never quite found her creative true love. I had given up on cultivating a creative life in exchange for raising a family of three boys and becoming an entrepreneur. Life was busy and there was no time for creative play, so I packed up my inner artist and all my art supplies and stowed them away in the "attic of life". Fast forward 21 years... My boys are grown and we decided to fulfill a life long dream of moving to Southern California and living at the beach. Settling in was very easy and life was amazing... but very quiet. One day it hit me - now what?? I'm 52 years old, in the second half of life and have nothing but time on my hands - YIKES! Who am I? What do I really want to be and do when I grow up?? So, what's a girl to do with all this reviving, rediscovering and reclaiming? Take another art class in search of her creative true love of course! I stumbled across a mixed media art class and the awakening began! This class became an unexpected voyage into my heart and soul. This creative adventure taught me so many things: I learned how to simply PLAY creatively. I learned how to let my heart lead the way in the creative process; to experiment, take creative risks, be outrageously curious, make impulsive creative decisions, let my child-like spirit and imagination run wild, and give my inner artist permission to proudly create. My creativity was unleashed and so was my joy! After diving into mixed media I soon realized it was not a perfect creative fit for me. However it unleashed a creative force in me and reacquainted me with my inner artist. At last, my creative true love!! 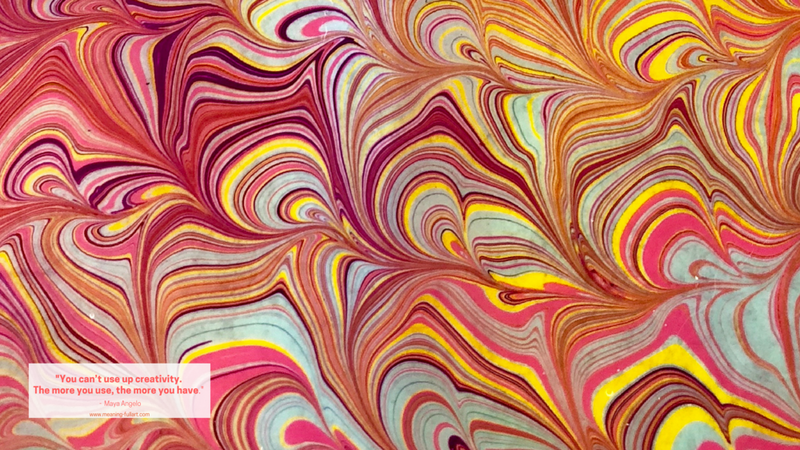 As I continued to consider different mediums and art forms, I came across an online video “Water Marbling on Silk”. My heart fluttered - a wearable AND decorative art form so beautiful AND functional. I was smitten and started doing research. Within days two friends shared the same video with me - a coincidence?? I think not! My research led me to a water marbling course. It’s in these classes that my artist’s heart fell in LOVE! This century old art form felt like home; familiar, comforting and full of joy. It came easily and felt effortless and natural. I was mesmerized, fascinated and infatuated with the process of the art. All the “work” required to water marble did not seem like work at all, but rather like a joy filled life giving ritual that fed my heart and soul. I fell fast, I fell hard and I fell completely for this magical art form. The obsession began… I took classes, I scour the internet and books for all things marbling, I joined online marbling forums and groups, I sought out suppliers and set up a marbling studio, I handcrafted marbling rakes and combs, I mixed paints and blended marbling baths, I washed and pretreated silk, I alumed paper, I floated paint on water, I practiced mastering traditional and contemporary marbling designs, I used marbling tools to create breathtaking designs, I transferred marbled designs onto textiles and anything that was not nailed down, I filled and emptied numerous 5 gallon buckets of water and marbling size, I cleaned up and started all over again. It’s true love. 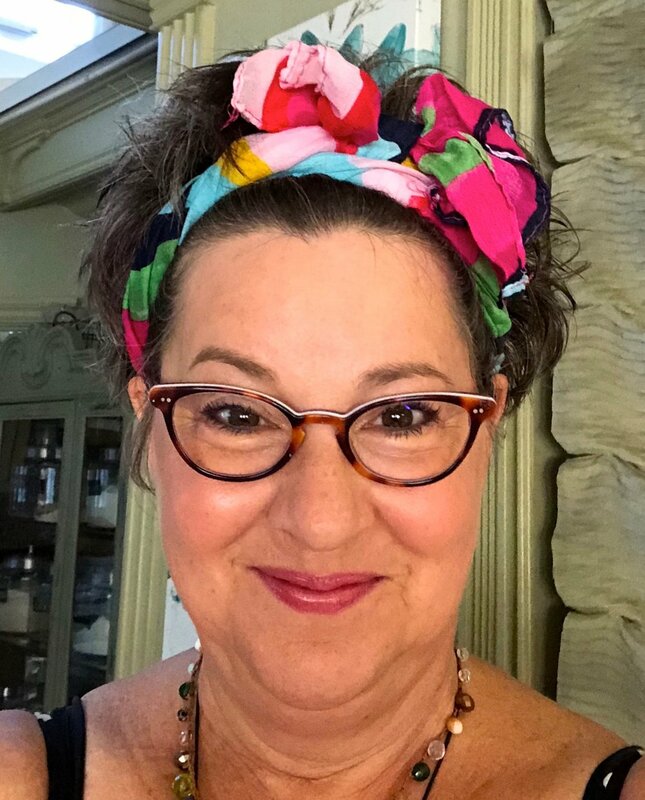 My fun, messy, beautiful, satisfying, and creative marbling life also includes Meaning-Full Art, my studio, gallery and classroom at Crafted Port of LA. It is here where I continue to learn and explore textile and surface marbling and now teach others about this magical century old art form. My colorful paint spattered studio is always buzzing with activity! In addition to creating and selling my lovely marbled works-of-art, I offer an exciting place for people to gather for unique creative art experiences. I teach classes on my obsession and creative true love, “Water Marbling” and “Fluid Acrylic Painting”. My classes are intentionally designed for an amazing outcome regardless of ones artistic ability, no previous art experience of any kind need! I love teaching, coaching and cheering on my students until they have created a work-of-art they LOVE and feel like an accomplished artist. I love what I do! Everyday I learn and grow as a person, artist and business owner. I feel blessed beyond all measure and look forward to what this messy creative life has in store for me. Life is good ya’ll!